You've only got 1 night to get it right in the Rock City! So don't take chances on any old New Year's Eve bash. Bar Louie - Bar Louie will have an open bar, even while keeping tickets at a relatively reasonable $75. A DJ to spin the evening's soundtrack, and a Champagne toast at Midnight round out the package. But wait - there's another nice touch: a hearty breakfast buffet from 12:30 - 2:00 AM. This is likely the best spot in Rockville for the young-and-single crowd on New Year's Eve. 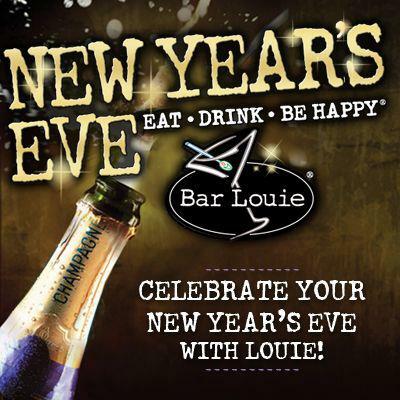 Call 240-238-1080 for tickets, or stop by Bar Louie in person. Rockville Hilton - Get tickets - and even hotel rooms to spend the night - for one of the few Latin-flavored NYE parties in the DC area. The DC Bachata Congress, Gringuito & Gata - in association with Salsa Metro's 14th Annual New Years Eve - are hosting the first annual Bachata New Year's at the Rockville Hilton. Performances by: Ataca & La Alemena Island Touch, Gringuito & Gata, Team Touch, and Irene Saucedo & her dancers. DJs will spin Bachata and "party music." They include DJ Tadeo, Dj Gringuito & DJ Kitty Kat. Up and coming Salsa & Bachata vocalists Enyer Bachata Boy & Yender Zambrano will also perform. You'll also get party favors, the live broadcast from Times Square, and a Champagne toast at Midnight. Gordon Biersch will be offering a New Year’s Eve for the craft beer enthusiast. Drink from Gordon Biersch craft beer casks until 2am. La Tasca - Start off between 8:30pm-10:30pm with unlimited tapas, a bottle of wine for 2 people, a champagne toast, and party favors. Live DJ music from 11pm to 3am.